Are you looking for a personal finance book which deals all aspects of investment in a simple and understandable manner? 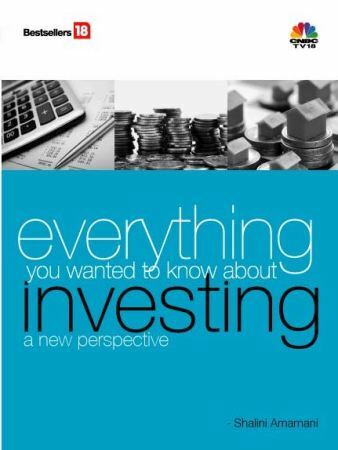 Then my recommendation will be recently published CNBC TV18 bestseller “Everything you wanted to know about investing-a new perspective” by Shalini Amarnani. This book is divided into three parts. Let us review each part of this wonderful book. This section mainly concentrates on the philosophy of investing and how you set your mind about investment. Few of lines which I liked are “A mother teaching her child is investing in her child’s future; taking a walk each morning is investing in your health and putting a part of your income into assets which give returns is financial investing. So investing is basically having a dream and putting available resources to work so as to achieve the dream in the foreseeable future.”. Also “Drive investments by looking through the windshield with some help from the rear view mirror”. Here windshield refers to your future financial goals and how you can plan them and rear view mirror indicates about the past performance of products and your financial life. This section deals with how you can set your financial goals, what are the mental barriers to achieve those goals and how to overcome. Good things come to people who wait-A old saying which beautifully described and best take away from this book. So investing in equity and waiting for the long term is the mantra we need to follow for a successful financial planning. Tax Planning is explained in a simple lines, so that even a layman can understand and apply to his personal financial life. It describes all five types of income sources and how we can use them efficiently to our tax benefit. At the end you will also find some tax tips also. 2) Making the winning choices-This section mainly dedicated to choosing the right product for your investment. Starts from equity direct investments to real investments. Equity-The first amongst equals-This section explains the importance of equity in your portfolio. Investment techniques are explained in detail including the technical analysis and how we can use charts to arrive at our entry into equity. Get the experts with Mutual Funds and ULIPs-This section deals with the importance of mutual fund and the various types in mutual funds. Also it describes how you can choose the products and what tax implication each product bears on your return. It also explains about the importance of ULIPs and who can invest in them. Future and Options-Hedging strategy or trading strategy, both are explained in detail. Debt-Let your money earn interest-You will find the detailed review of each debt product available in India for retail investors. This section describes each product ranging from liquid funds, debt funds, bonds to post office schemes and taxation of each product. Getting real with your investments-Finally, this section have reviews of real investments like property, gold and other commodities. Starting from how and who can opt for real investments, what caution you need to take and the taxation of each asset class. A hard look at your liabilities-Explains about home loan and its nitty gritty. Then is the insurance. It is explained in a simple manner like what are current insurance products available and which one you must have. Happiness economics-This section is all about the things you want to have in your life other than the basic planing like international trip, the car of your choice or phone of your choice. Giving you the head start advantage-Planning is a life long journey. So investing once and forgetting is not a best practice. These tips like how and when you need to monitor and what caution you need to take in the future about your finance are discussed in detail. This is what described about the author in this book. Shalini Amarnani is contributing to various financial websites and blogs and a highly sought-after speaker. Knowing how to manage money is one of the most beneficial life skills for people at every age. She is committed to simplifying money matters and increasing financial literacy both in the present and the future. Utilizing a clear and straightforward approach, she provides advice for integrated, holistic financial life planning and investment management. Shalini holds a masters degree in Financial Management and has several years of experience starting from 1994. She lives in the financial heart of India, Mumbai with her husband and a son. So can you buy it? what is Magic of Double Indexation concept ? how the investor avail this benefit and is tax implication on these fund,what is exact it means,what are pros & cons for this Magic of Double Indexation concept. with hope of a clear picture of this from your side at the earliest. Pls try to provide a column for fresh querry posting. Raj-Double indexation benefit applies to these funds only if your investments are more than a year. It is a lengthy topic to describe. You can google it and will find plenty of info on this. But do remember that FMP means tenure is only fixed but not the return. The second thing is, your investment will be locked till maturity. Hope this http://articles.economictimes.indiatimes.com/2012-06-11/news/32174934_1_fmps-double-indexation-maturity-plan will give you some more information.